Ex-CIA operative, Devereaux (Pierce Brosnan) is enjoying retirement when his old CIA handler, Hanley (Bill Smirovich) shows up telling him he has been requested to extract an old friend, Natalia (Mediha Musliovic), from her undercover assignment. Natalia has information the CIA needs to control soon-to-be President of Russia, Arkady Federov (Lazar Ristovski), but she won’t give that information until she is safe. Devereaux successfully grabs Natalia and while they are driving she gives him the information the CIA needs, which, unfortunately, made her expendable. Devereaux’s ex-student, Mason (Luke Bracey), is ordered to kill Natalia, and does so. Problem is, that pisses off Devereaux (he loved Natalia) and he kills the entire CIA hit team…except his old friend and student. Devereaux is put on the CIA hit list to stop him from going after everyone involved in Natalia’s death, and Mason is tasked with his killing. What follows is a cat-and-mouse thriller that is violent, bloody, and intriguing. Pierce Brosnan and Luke Bracey are both terrific. 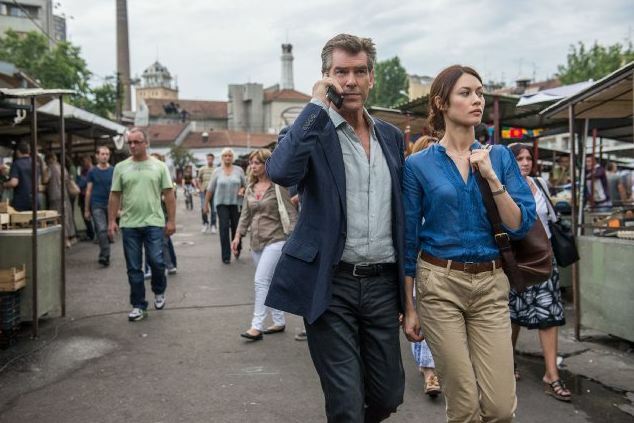 “The November Man” is a much better movie than the “critics” seem to think. Again, I think they only watch the trailers, or go into the movie with their minds set based on an early review that they read. They are doing a dis-service to this movie (and others that they do this to) because “The November Man” is a taught, well laid out, thriller with surprising twists and turns. Edge of your seat action at it’s best.